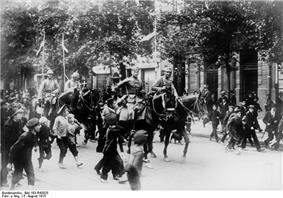 Orange: Central Powers and their colonies. Green: Allies and their colonies. 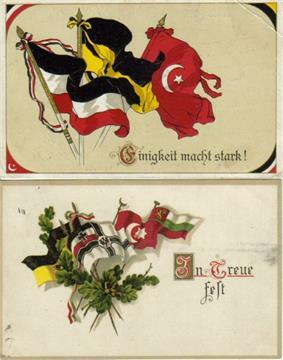 The Central Powers (German: Mittelmächte; Hungarian: Központi hatalmak; Turkish: İttifak Devletleri or Bağlaşma Devletleri; Bulgarian: Централни сили Tsentralni sili), consisting of Germany, Austria-Hungary, the Ottoman Empire and Bulgaria – hence also known as the Quadruple Alliance (German: Vierbund) – was one of the two main factions during World War I (1914–18). 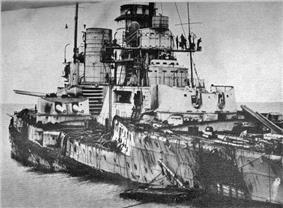 It faced and was defeated by the Allied Powers that had formed around the Triple Entente, after which it was dissolved. 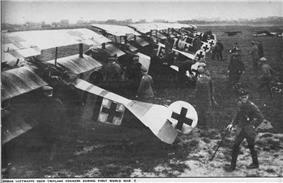 Subsequently several states declared war on Germany, including: Japan declaring war on Germany in late August 1914; Italy declaring war on Austria-Hungary in 1915 and Germany on August 27, 1916; the United States declaring war on Germany on April 6, 1917 and Greece declaring war on Germany in July 1917. Austria-Hungary regarded the assassination of Arch Duke Franz Ferdinand as being orchestrated with the assistance of Serbia. The country viewed the assassination as setting a dangerous precedent of encouraging the country's South Slav population to rebel and threaten to tear apart the multinational country. Austria-Hungary formally sent an ultimatum to Serbia demanding a full-scale investigation of Serbian government complicity in the assassination, and complete compliance by Serbia in agreeing to the terms demanded by Austria-Hungary. 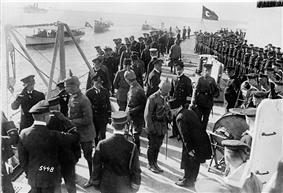 Serbia submitted to accept most of the demands, however Austria-Hungary viewed this as insufficient and used this lack of full compliance to justify military intervention. These demands have been viewed as a diplomatic cover for what was going to be an inevitable Austro-Hungarian declaration of war on Serbia. 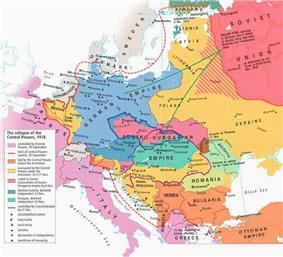 Austria-Hungary had been warned by Russia that the Russian government would not tolerate Austria-Hungary crushing Serbia. However with Germany supporting Austria-Hungary's actions, the Austro-Hungarian government hoped that Russia would not intervene and that the conflict with Serbia would be a regional conflict. During 1917 and 1918, the Finns under Carl Gustaf Emil Mannerheim and Lithuanian nationalists fought Russia for a common cause. 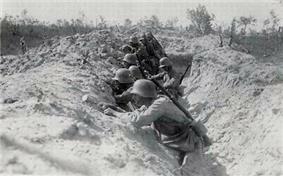 With the Union of Soviet Socialist Republics's aggression of late 1917, the government of Ukraine sought military protection first from the Central Powers and later from the armed forces of the Entente. In 1918, the Mensheviks and nationalists, was occupied by the German Empire, which expelled the Bolsheviks and supported the Mensheviks. 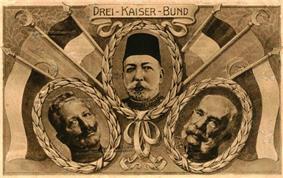 The three emperors: Kaiser Wilhelm II, Mehmed V, Franz Joseph. 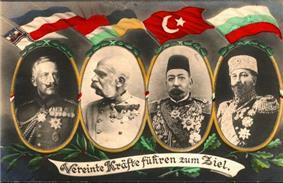 A postcard depicting the leaders of the Central Powers. Svetozar Boroević: Austro-Hungarian field marshal regarded as one of the finest defensive strategists of the war. ^ Hindenburg, Paul von: Out of my life. P. 113. ^ Meyer, G.J. (2007). 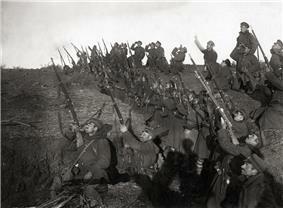 A World Undone: The Story of the Great War, 1914 to 1918. Delta Trade Paperback. ^ Hickey, Michael. 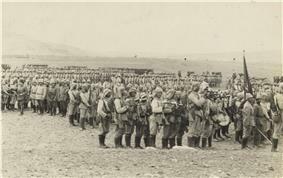 The First World War: Volume 4 The Mediterranean Front 1914-1923. P31. ^ J. M. Roberts. 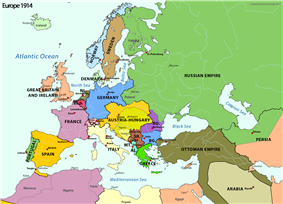 Europe 1880-1945. P. 232. ^ Hala Mundhir Fattah. The Politics of Regional Trade in Iraq, Arabia, and the Gulf, 1745-1900. P121. ^ Davis, Robert T., ed. (2010). U.S. Foreign Policy and National Security: Chronology and Index for the 20th Century 1. Santa Barbara, California: Praeger Security International. p. 49.